(Nanowerk Spotlight) In conventional chemotherapy, doctors are using a carpet bombing approach to destroy cancer cells: the patient is pumped full of cytotoxic drugs, that go everywhere in the body, with the hope that enough of the drug molecules reach the cancer cells and target their nuclear DNA to damage it or destroy the cell. By contrast, nanomedicine attempts to pinpoint individual tumor cells and deliver nanoparticles with or without therapeutic payloads right into the nucleus (see for instance: "Destroying cancer cells by remote activation of intracellular nanoparticles") where they destroy the malignant cell by chemical or mechanical action. While nanoparticles are emerging as drug carriers for targeted nanomedicines, preclinical assays to test nanoparticle efficacy are hampered by the lack of methods to quantitatively determine internalized particles. A novel method, developed by scientists at the California NanoSystems Institute (CNSI), is suited to pave the way for preclinical testing of nanoparticles to establish dose-efficacy relationships and to optimize biophysical and biochemical parameters in order to make better drug delivery vehicles. The team, led by Claudia Gottstein, Adjunct Assistant Professor, MCD Biology, and Director, Biological Nanostructures Lab at CNSI, demonstrated that it is possible to determine the exact number of nanoparticles inside a cell through a combination of three methods and a mathematical model which they developed to link the data from these three methods. As the researchers report in the May 24, 2013, online edition of ACS Nano ("Precise Quantification of Nanoparticle Internalization"), this is a generic technique for precise determination of nanoparticle uptake into cells, making possible a readout of average number of nanoparticles internalized per cell. "This is of utmost importance for a number of biomedical applications," Gottstein explains to Nanowerk. "The differentiation between only adhered and internalized particles has been a big unsolved problem in the field. For example, many drugs work intracellularly, and mere binding without internalization would render those drugs ineffective. We present a generic solution to this problem." Furthermore, as she points out, comparison of data from different labs has so far been difficult at best. "Our method allows for standardization and facile side-by-side analysis of internalization data from different materials and different labs." – Comparison of data between different materials and different labs. Gottstein and her team used a high-throughput technique – Fluorescence Activated Cell Sorting/scanning (FACS) – combined with confocal laser scanning microscopy (CLSM). 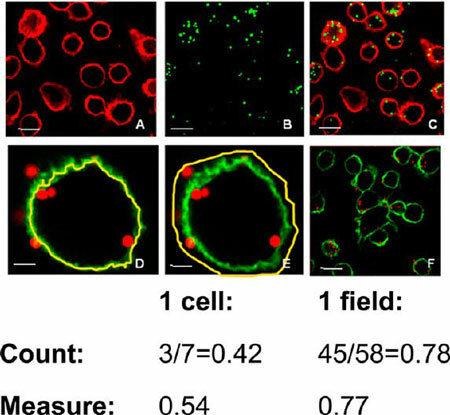 Already, researchers have been combining FACS and CLSM to obtain quantitative data on particle association with cells, and qualitative data on internalization – but the data are presented as independent sets. By contrast, the CNSI team measures internalization quantitatively by CSLM and integrate this data with high-throughput FACS data for a precise measurement of nanoparticle uptake. In addition, they introduce a correction factor – which has an impact on confocal microscopy as well as on FACS measurements – that accounts for a potential change of fluorescence intensity upon internalization. The researchers first derived and validated their method using polystyrene particles and then applied it to the impact of different surface coatings vesosomes on their uptake by cells of the reticuloendothelial system. Apart from basic research on materials' properties and their influence on particle behavior in biological contexts, potential applications of this work include preclinical testing of drugs (correlation of internalized particles with drug effect) and the optimization of drug delivery vehicles (impact of biochemical and biophysical parameters on targeting performance). "We see this method as a starting point for further refinements, such as automatization and further delineation of particles in distinct subcellular compartments," says Gottstein. "This will provide a wealth of information." She points out that some challenges need to be overcome in the areas of developing efficient fluorescent labeling techniques for a wide array of nanoparticles, investigating the impact of the label itself on biological and biophysical functions such as binding, internalization, aggregation.